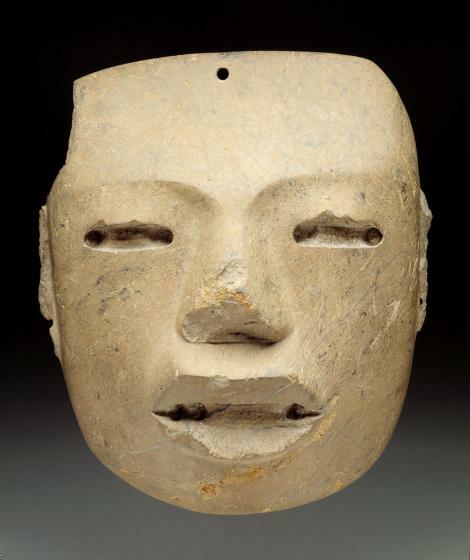 The human face was a popular sculptural theme at Teotihuacan (Teotihuacán), where it was carved in a range of sizes and in a variety of stones. The face is generally triangular in shape and has a wide, low forehead. The eyes are not pierced, but their deep cavities were originally inlaid with a contrasting, less permanent material. The everted lips may once have framed inlaid teeth. It is often thought that the masks were funerary and would have been attached to funerary bundles. The mass and weight of this example suggest another function. Drilled holes would have allowed attachment, perhaps to an image of the human figure made from perishable material. Impersonal yet imposing, the masks convey an emblematic sense of authority.